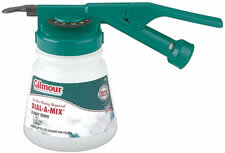 Hose End Dial-A-Mix with 16 oz holding tank. This piece of equipment enables you to treat garden and yard areas easily. The chemical concentrate is put into the sprayer and then the dial on top is adjusted to the right setting which is adjustable by increments of teaspoons. Remember, there are 3 teaspoons to every tablespoon and 6 teaspoons to every ounce. This sprayer has a maximum setting of 21 which is 21 teaspoons or 3.5 oz per gallon of water. Next you attach it to your hose. When you squeeze the trigger of this sprayer, the concentrate is then sucked out of the tank as the water flows through it and mixed at the nozzle of the sprayer. Mixture is accurate and precise. You are able to restore unused chemical concentrate for future use since no water goes into the sprayer tank. This key part of the design is important making this a big improvement over the first two hose end sprayers which usually have water added to the tank in order to spray whatever material you want to apply. With the first two sprayers, you almost always have to use what you mix up. With this sprayer, you can pour a bunch of liquid concentrate in the tank, spray till you’ve applied enough and then whatever is left over can be stored in the sprayer or poured back into the original container. This sprayer enables you to pump big amounts of water for turf applications and since its working off of the water from a garden hose you can usually reach high places if needed. View this in depth video which does a good job of explaining just how this sprayer works.